The Counseling Program offers professional, affordable counseling and therapy services. Our licensed, professional staff provides confidential counseling for individuals (children, adolescents and adults), couples, and families. Stress, high anxiety, depression, social isolation, family relations, and academic issues are some examples of the types of problems that we assist clients with. We provide a safe, non-judgmental environment with professionals using some of the most effective therapeutic modalities available. Our goal is to help those in need, and we take your financial needs into consideration when establishing fees for counseling services. Those without health insurance coverage are eligible for a sliding scale fee based on household income and family size. We also have counselors on staff that are eligible to accept many insurance plans. Appointments are flexible with the needs of our clients the primary consideration. Our hours of operation are Monday-Friday 8:00 AM – 5:00PM. We are open until 7:00 PM on Thursday evenings. Contact Jody Kenyon at 607-334-8244 for more information on our various counseling services. 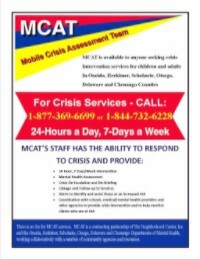 Website to assist school personnel and professionals in Tompkins, Seneca, and surrounding counties with making referrals for student mental health issues, and to provide resources.